Today church members were able to purchase jars of sweet cucumber relish, for their immediate enjoyment or as “stocking stuffers” or gifts, thanks to the donation of boxes of cucumbers by Ben Doiron and Elsie Salter, and the efforts of a dedicated team of cooks. 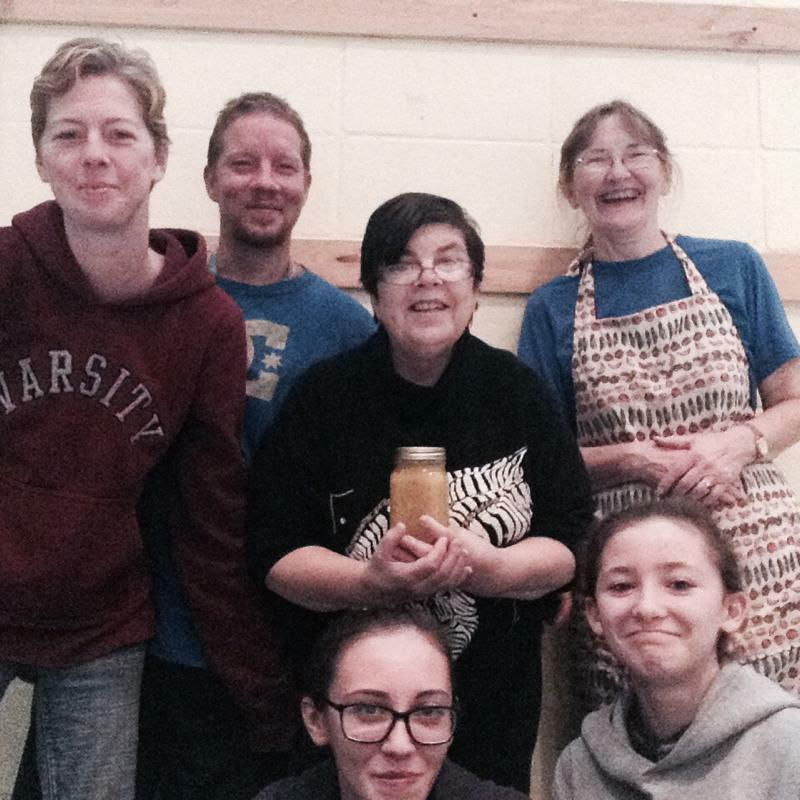 Yesterday, Reverend Alice and six other members and adherents laboured in the kitchen to produce several gallons of the relish, and sealed them in 250ml and 50ml mason jars. On sale today, almost one half were sold for net proceeds of just over $140. Thanks to all who contributed their energies, or who took home one (or more) of these little goodies. The final results are in and the net proceeds are $294 and some very happy tastebuds. Thanks to all! These events have been added to the calendar as well! Petro-Canada is offering 2.5% instead of 2% (They’re also having a contest where you can win free gas for a year!). Kelsey’s Restaurant is offering 5% instead of 3%. Montana’s Restaurant is offering 5% instead of 3%. Swiss Chalet is offering 5% instead of 3%. Milestones Restaurant is offering 5% instead of 3%. Harvey’s is offering 5% instead of 3%. Foot Locker is offering 7% instead of 5%. Casey’s is offering 5% instead of 3%. Darcy McGee’s is offering 5% instead of 3%. East Side Mario’s is offering 5% instead of 3%. Fionn MacCool’s is offering 5% instead of 3%. Paddy Flaherty is offering 5% instead of 3%. Prime Pubs is offering 5% instead of 3%. The Biermarkt is offering 5% instead of 3%. Tir Nan Og is offering 5% instead of 3%. There’s quite a few this month, so if you see any that interest you, please contact Nancy Christie for your gift cards. Golf Town is offering 7% instead of 3%. La Vie en Rose is offering 11% instead of 8%. La Vie en Rose Aqua is offering 11% instead of 8%. Spafinder Wellness 365 is offering 13% instead of 10%. See Nancy Christie to order your Fundscrip! Hello everyone! We hope you’re excited for this week’s activities. This Sunday is Palm Sunday and our lovely pageant entitled “HEROse” will be happening Sunday. The service will take place in the Memorial Hall, so please bring your friends and family out for this performance to remember. M & M Meat Shops is giving 4% instead of 3%. Teriyaki Experience is giving 12% instead of 10%. Pet Smart is donating 4% instead of 2%. Don’t forget to talk to Nancy Christie to order your Fundscrip! Also, the Match game has restarted, so you’re invited to bring some lovely desserts on Sunday or join us for some delicious treats. Hi everyone! Sorry my title couldn’t be more exciting, I couldn’t think of a word for specials that started with F.
Roots, Roots Kids and Roots Home are offering 14% instead of 10%. The Gap and Baby Gap are offering 7% instead of 5%. Old Navy is offering 7% instead of 5%. Banana Republic is offering 5% instead of 7%. La Vie en Rose and La Vie en Rose Aqua are offering 11% instead of 8%. The start of a new year means a new January; the start of a new January means it’s a new month. As always, new month means new Fundscrip promotions! Coles/Chapters/Indigo are having a special where they will donate 12% of your gift card purchase to Saint Andrew’s as opposed to 5%. Starbucks is giving 6% instead of their regular 5%. Finally, Red Lobster is donating 7% instead of their normal rate of 5%. Be sure to find Nancy Christie on Sunday mornings or place your order with her at 450-691-7673 before 9:00 on Monday mornings to receive your Fundscrip the following Sunday. We hope you all enjoyed a wonderful Christmas season with your family. Happy New Year! As always, there will be a Church service tomorrow morning and we hope you’ll be able to brave the cold to join us. Sunday School resumes next Sunday, January 11th. We officially have the team names for the Amazing Grace. Thanks to our wonderful cameramen, we’ll be able to create an episode between now and Christmas. Thanks to everyone who helped out and we look forward to making another race next year. Are those ponies on the front lawn?